I work a couple of days a week as a marketing department photographer for Alta Ski Area. For the most part, I get to ski where I want and take pictures of whatever I want. 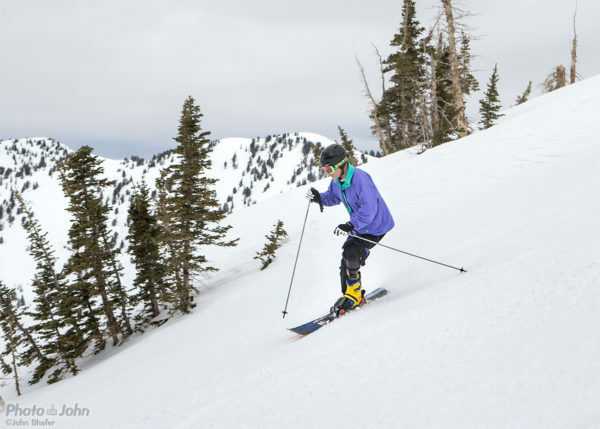 The main goal is to show off what is arguably the best ski area on the planet. It’s a pretty easy job – especially during a winter like this one, where I’ve skied more powder days than groomer days. However, skiing with adaptive skier Greg Hansen will probably be one of the most memorable ski days of this season, for me. 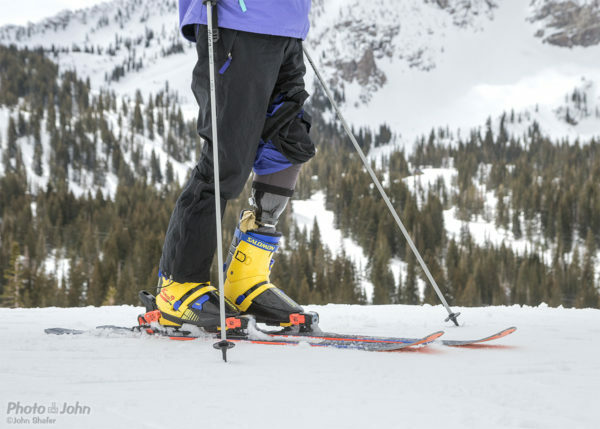 Greg Hansen’s FitProsthetics leg in his ski boot, at the top of Alta’s Sunnyside lift. As I said, I mostly ski and shoot wherever I want. As long as I get photos that represent the resort and current conditions, it’s all good. But sometimes, I get an assignment from the boss. Yesterday, my assignment was to the PR department to ski with Greg Hansen, a recent amputee. Nine months ago, Greg got hit by a truck while he was riding his motorcycle and lost his left leg below the knee. He just got a new leg from local custom prosthetic builder, FitProsthetics, and wanted to try it out on the snow. 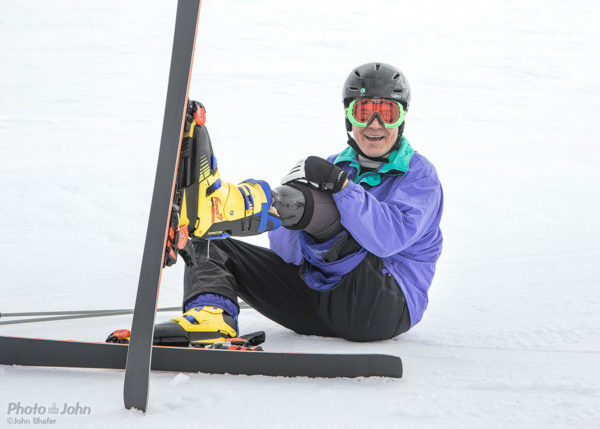 Greg has been skiing for his whole life and has worked hard in physical therapy so he can stay active. 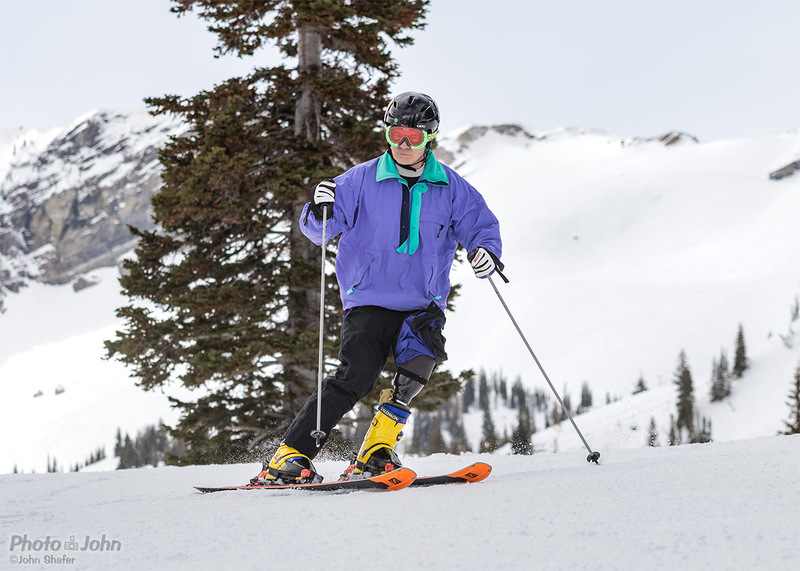 A few weeks ago he skied a few runs on his old prosthetic with Wasatch Adaptive Sports at Snowbird. But his new leg fits a lot better and he was excited to try it out on something more than just the bunny slope. Greg Hansen at Alta Ski Area with his new FitProsthetics leg. Our plan was to start out easy on the very gentle Snowpine Lodge lift to evaluate Greg’s skiing. However, we somehow ended up going straight up the Sunnyside lift. It’s still beginner terrain but I was surprised we jumped right in. Greg started out a bit tentatively but it quickly became clear that he was a great skier with excellent technique. In spite of losing his leg less than a year ago and this being only his second time on the snow since his accident, he skied like a boss. This is a testament to his positive spirit and all the hard work he’s put in since he lost his leg. He’s also just a really good skier. It was surprising to me how much his pre-accident technique carried over to skiing with a prosthetic leg. He has great upper body form and nice ski angulation. Honestly, Greg skied better than the majority of skiers on Sunnyside’s green terrain. And he did it with one leg. 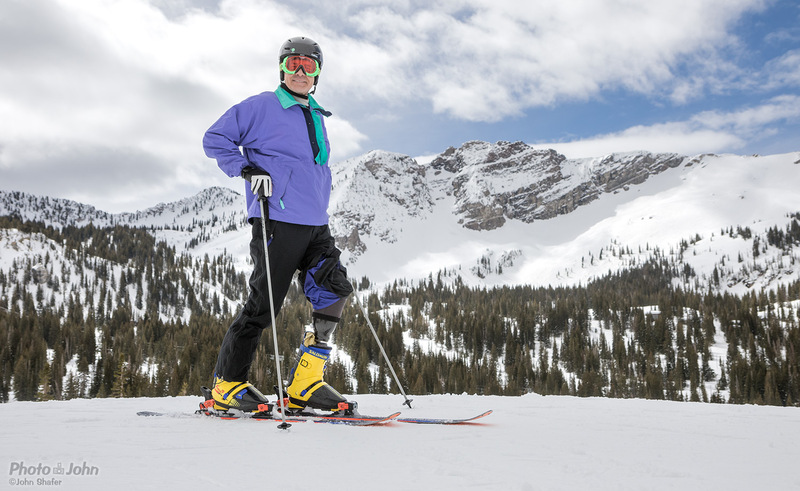 Adaptive skiing at Alta with amputee Greg Hansen. It was super inspiring to spend some time with Greg, talk to him about his accident and witness the joy he got from being back on skis. He really benefited from his previous ski experience and fitness. Occasionally, his left ski got away from him but he made a lot of beautiful turns and I doubt anyone would guess he’s skiing on a prosthetic leg. I’m really interested to see what he’ll be able to do next winter, after a year of rebuilding muscle and fine-tuning his prosthetic fit. Watching him ski, I wouldn’t be at all surprised if he’s able to get back to skiing nearly the whole mountain. 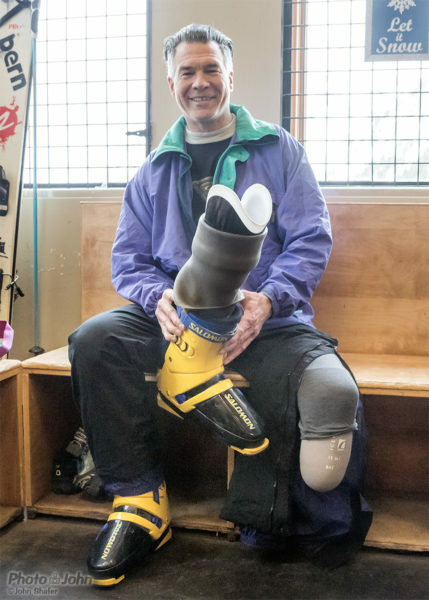 Greg Hansen’s great ski technique is obvious, even though this was his first serious day skiing with his new prosthetic leg. I love skiing overhead powder and fresh creamy corduroy. But having the opportunity to meet people like Greg and learn from their experience is one of the best parts of my job at Alta. Thanks for coming to ski with us, Greg. Don’t be a stranger. Please come back and let’s do it again soon. Greg Hansen has that PMA – Positive Mental Attitude. Positivity is the best explanation for his rapid recovery and his most memorable personality trait.